My news about where I am exhibiting, where I am teaching, and the art events I am involved in. Good news. 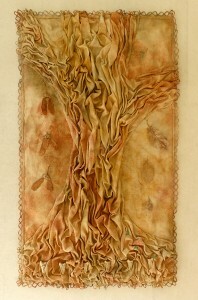 My work ‘Earth Repair’ has been accepted into the World of Threads Festival Display Area Gallery. ‘Earth Repair’ is an ongoing project that has been a number of years in the making. 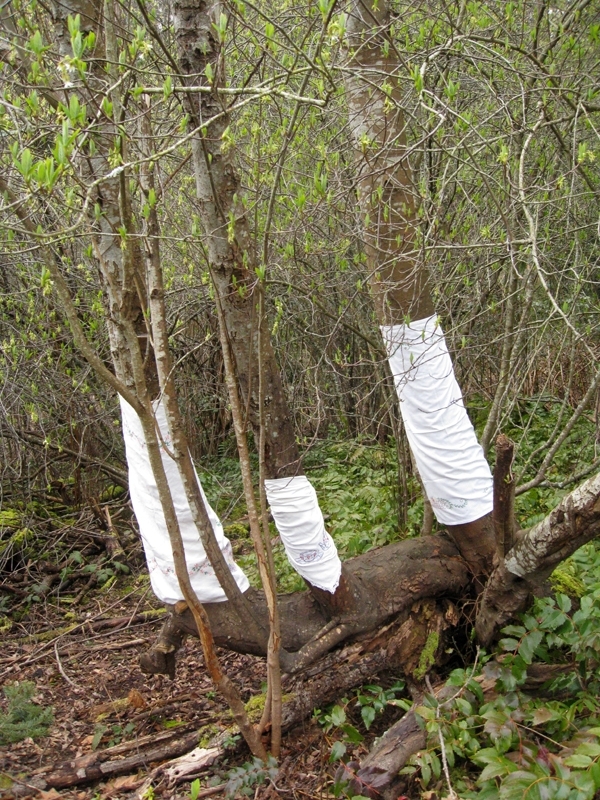 This work began in the spring of 2011 when I wrapped three afternoon-tea cloths around the trunk of an Indian plum tree after hungry deer had eaten the bark. The cloths stayed there for a year and a half before I brought them inside for laundering and repair. Since then I have added layers to the cloth every year. 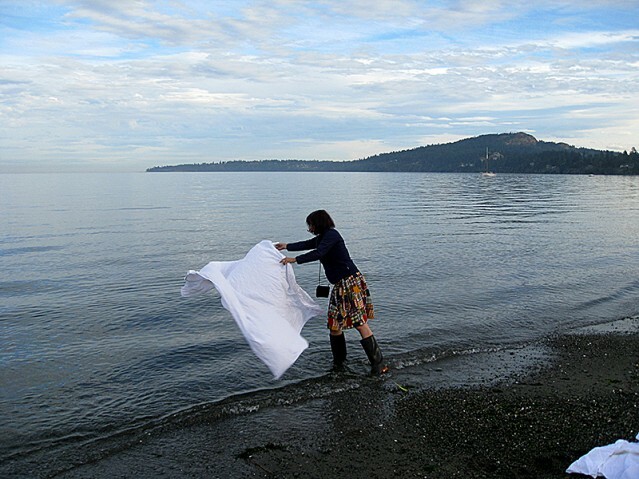 This is a themed collection of works by Canadian Surface Design Association members has finished its country-wide tour in Pender Harbour, on the west coast. Works are being returned to their owners, the eleven that sold being sent to new owners. 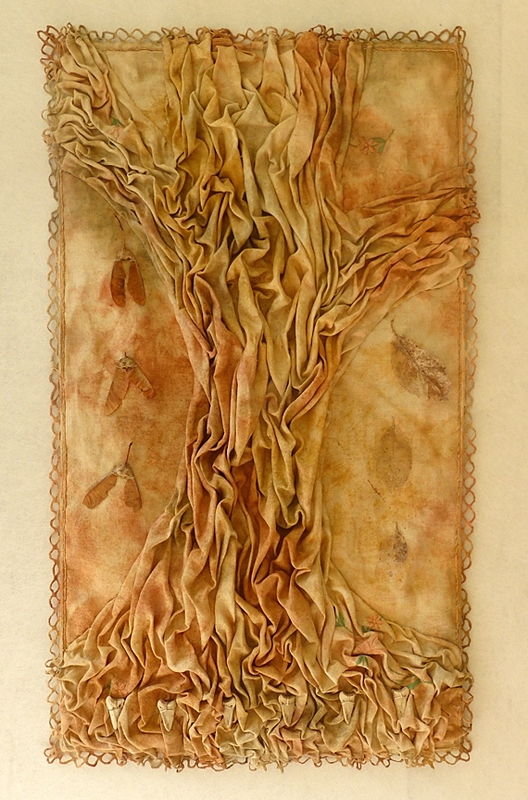 My entry, ‘Forest Reliquary’ is off to its new owners because it sold. I am delighted it has a new home. A reliquary is a container of holy relics or objects, with the purpose of display or protection. This forest reliquary displays the life cycle symbols of growth, decay, death, and regeneration, the subject of my current practice. Techniques: Earth dyeing, spore printing, hand stitching (furrowing, whipped double running stitch, attachment).